Glen Urquhart and Mallard Creeks both flow into Dyke Slough on the north side of the K’ómoks Estuary. The Dyke Slough in turn drains into Hollyhock Flats one of the most productive natural habitats left in the K’omoks Estuary. The creeks have been severely impacted by agricultural practices and upstream urban development. They each support salmonids at present, but available spawning and rearing habitat is very limited. Water quality from development in the upper reaches is also an issue. Preliminary topographic survey of both creeks was needed to determine options for future stream restoration. 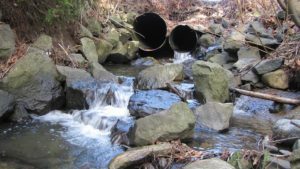 Project Watershed obtained seed funding of just under $5,000.00 from the Fish & Wildlife Compensation Program in 2016 to carry out stream surveys of both creeks. Project Watershed partnered with Ecofish Research Ltd. on this project – Ecofish generously provided a substantial amount of in-kind labour and expertise. 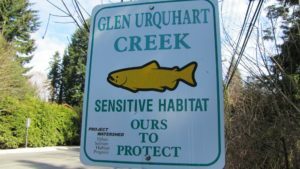 Project Watershed contacted local land owners including Ducks Unlimited Canada and the BC Nature Trust to access these streams thorough their properties and survey work was undertaken last fall. The results are now being complied. 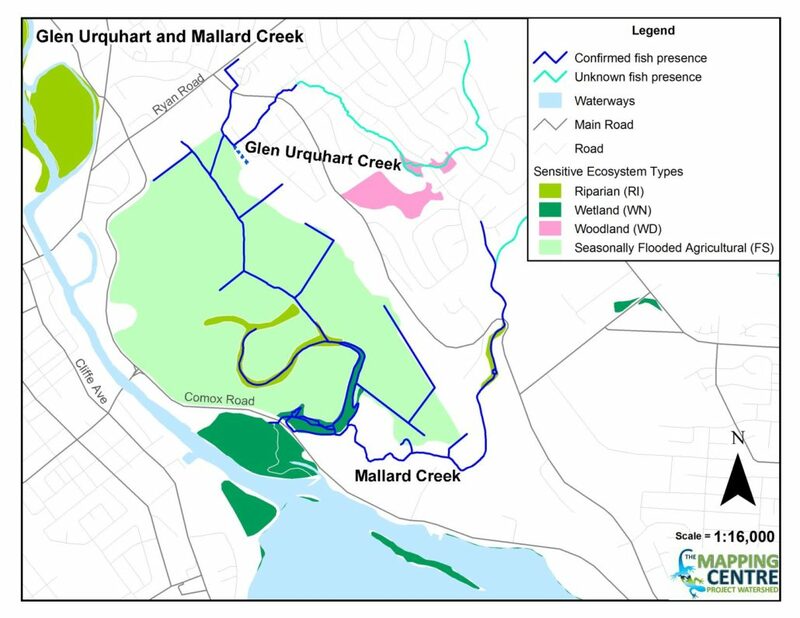 The data will be used to update and add to Project Watershed’s Sensitive Hapitat Mapping Work compiled for Mallard (Map) and Glen Urquhart (Map, Report) last updated in 2003. T his survey data was also identified as an information gap by a stakeholder committee led by the CVRD that is looking at the functioning of the Dyke Slough tide gates (which control salt water intrusion into the adjacent farmland). These gates limit salmonid access into to the slough and into Mallard and Glen-Urquhart Creeks. 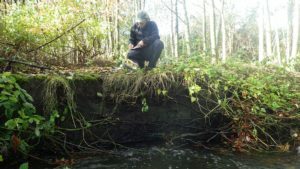 The aim of the stakeholder committee is to determine if and how tidal inundation can be introduced to the slough to facilitate more fish access, while balancing the freshwater values of the slough for other wildlife and the socio-economic value of farming around the drainage.